In any case, let’s talk about the tour itself. 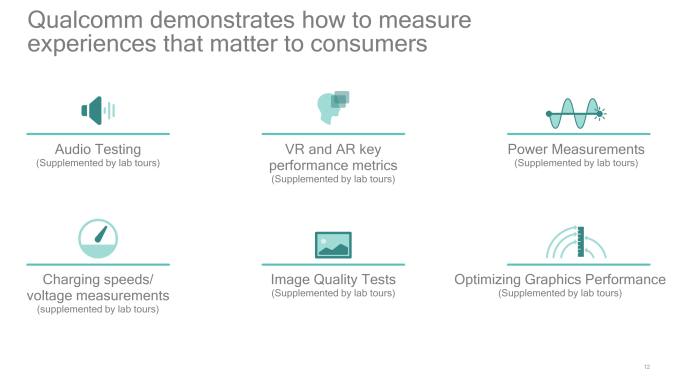 A first for Qualcomm, the company has given us a bit of access to show off some of the aspects of their SoCs we can’t easily measure ourselves, or to show off other parts of the Snapdragon platform (such as the software stack) that can’t be empirically measured. Given that Qualcomm has historically kept to themselves and been hesitant to engage with tech journalists, even a limited tour is a notable shift for the company. Not to mention a promising sign that, if nothing else, they better understand that the work their engineers and other staff put into products like the Snapdragon 835 deserves to be in the spotlight as well. The idea that engineering is cool isn’t just a STEM educational platform, but something we at AnandTech experience week in and week out. Given that Qualcomm’s meeting room for press testing was only setup to test performance and not power consumption, it was only fitting that the company’s tour started at their power lab. Here, director of product management Johnny John had setup a demo comparing the power consumption of Snapdragon 820 versus 835. While the usual caveats apply – mainly, that this was a prearranged demo that we didn’t control – it none the less suitably highlights both the power consumption improvements of 835, and Qualcomm’s direction with balancing power consumption with performance for the new SoC. For this demo, Qualcomm set up otherwise identical development phones running the SD820 and SD835 respectively. 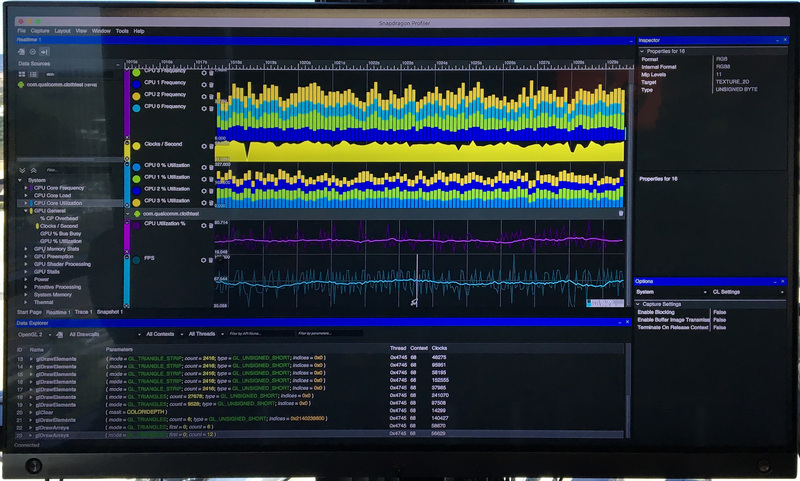 Both were running the same fixed VR workload as an example of a high power consumption task. Since this was a fixed workload, the faster SD835 phone in turn gets to bank the entirety of its advantage in power savings. Meanwhile to measure power consumption, Qualcomm’s power measurement gear tapped into the phones at the battery level, so these are phone-level measurements. The end result had the SD820 phone drawing an average of 4.6W, while the SD835 phone was drawing 3.56W, a power reduction of 23%. Real world use cases won’t be fixed workloads, so the power gains won’t be quite as great, but it shows where Qualcomm’s customers can go in configuring their devices. And indeed, Qualcomm’s own reference devices seem to be tuned a bit more towards power savings than performance, going hand-in-hand with the SoC size reduction that Qualcomm has also gone for with their new SoC. Customers make the final call, but Qualcomm seems to be nudging customers towards using their 10nm gains to curb power consumption more than improve performance. 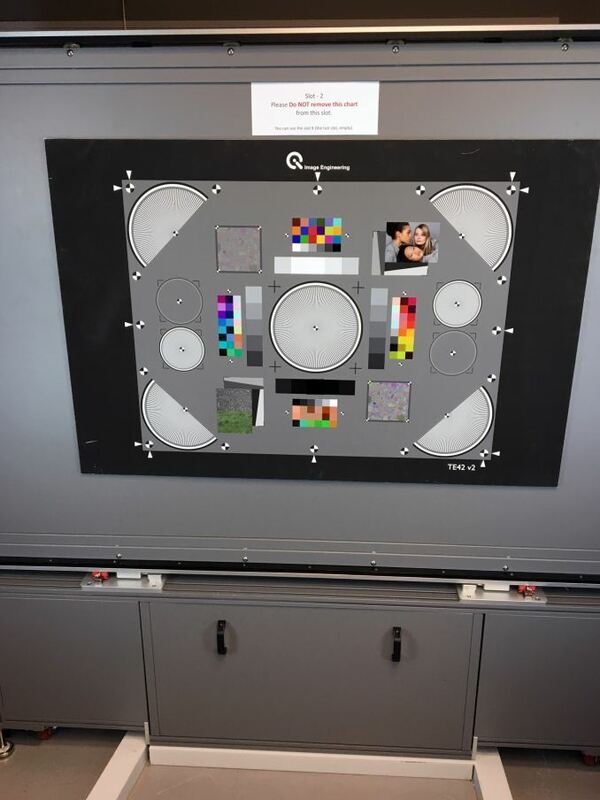 The second stop on Qualcomm’s tour was what they call their Snapdragon Advanced Content Lab. 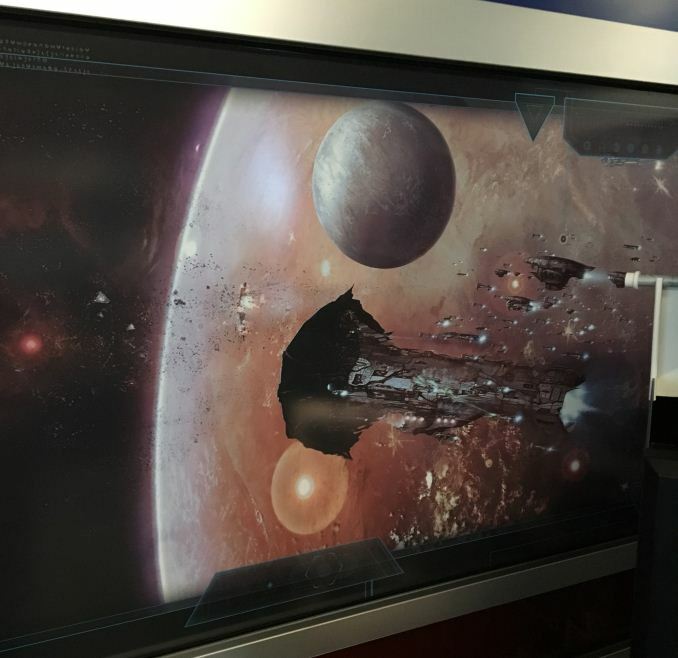 This lab’s focus was on graphics and AR/VR development, though as the polar opposite of a Spartan lab or meeting room, “den of geeks” may be the better description. To be honest, coming off of CES and GDC, Qualcomm’s advanced content group didn’t have much new to show off. 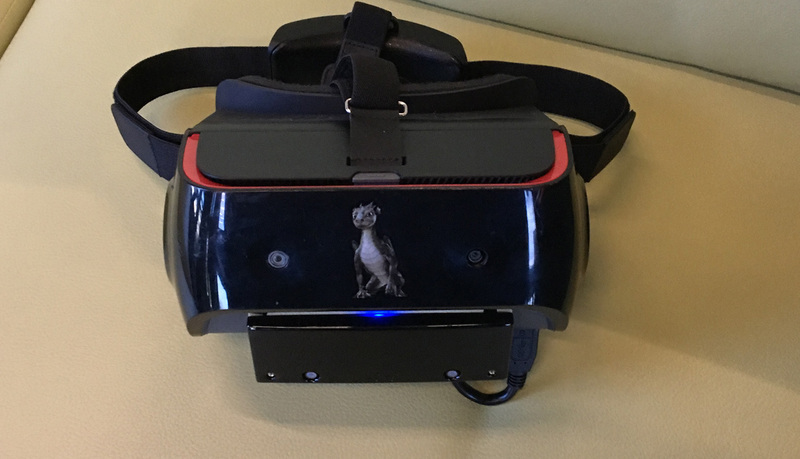 The company is continuing to focus on getting Snapdragon SoCs into VR/AR headsets, and has been producing demos, hardware prototypes, and software toolsets to that end, all of which they have been showing off at the aforementioned trade shows. 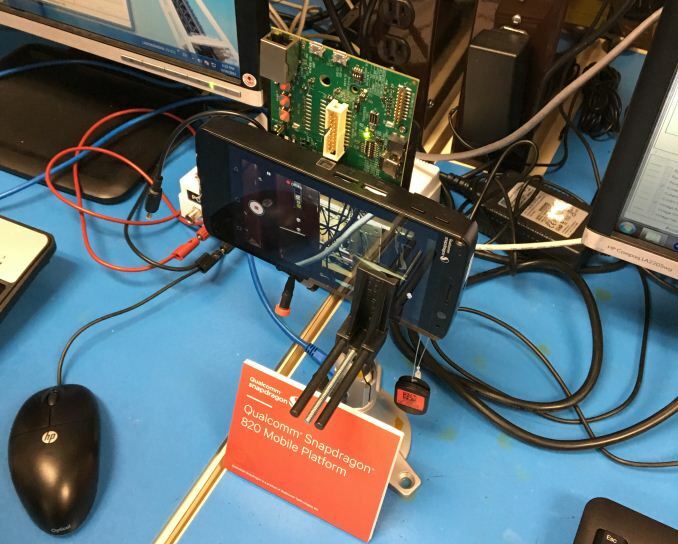 This is essentially the backend heavy-lifting that Qualcomm is doing to enable devices like the Pico Neo CV that we saw at GDC this year. Along those lines, the company is also keen on showing off the software side of the equation with their performance profiling tools. The nuances are admittedly more something a developer is going to appreciate than an end-user, but it is a prime example of why the company is eager to brand Snapdragon as a platform as opposed to a processor. In the long run, they expect that software will become a much greater part in defining the overall platform. 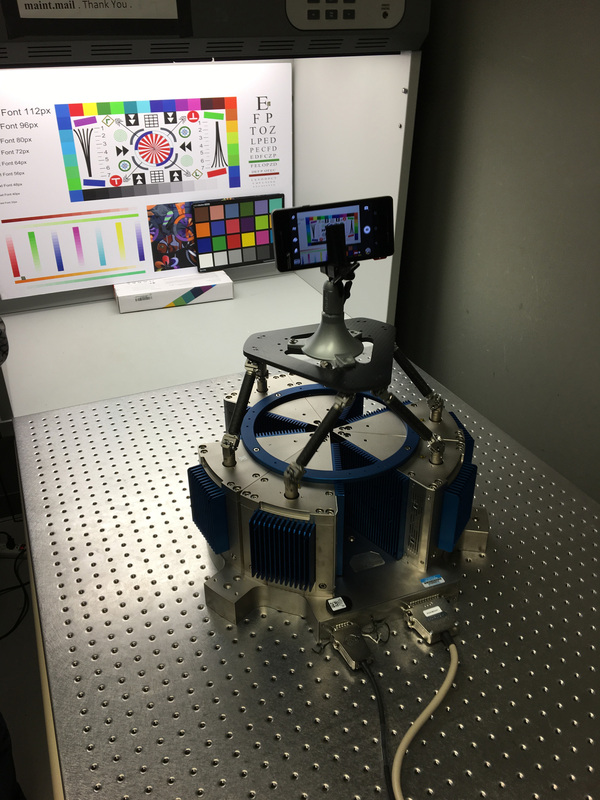 Our third stop was the company’s camera testing lab, which although was primarily demonstrating well-known methods for camera testing, was impressive in scope and price tag (ed: especially to tech journalists who would kill for similar equipment for phone reviews). The takeaway, at a high level, is that Qualcomm wants to show off the rigors of their testing methodology, and that every decision they make with their ISPs and associated software are based on significant empirical testing. 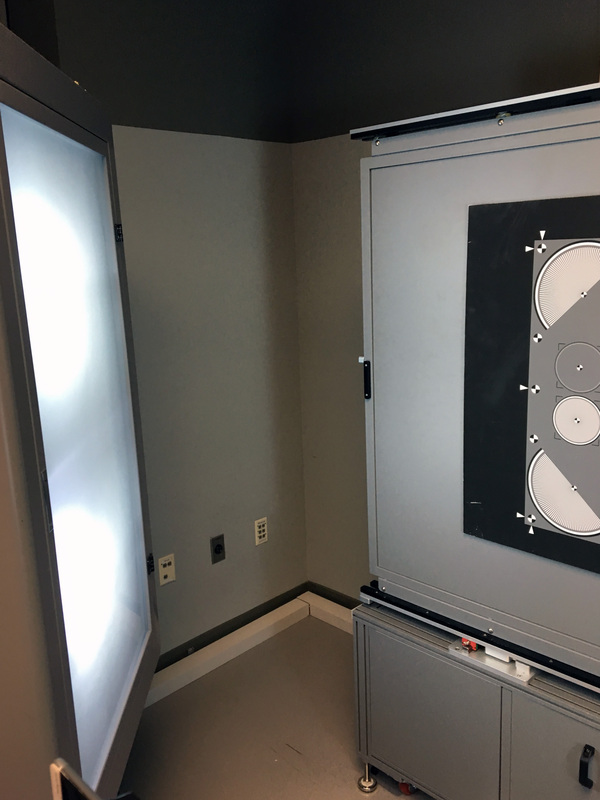 On the photo side of matters, the company has a few interesting tools at their disposal, the most useful likely being their variable lighting system, a pair of massive light cabinets that can generate light at a range of intensities and color temperatures. And though it may sound trivial, as our own Joshua Ho can attest to first-hand, this kind of consistent, systematic testing is not easy to do. 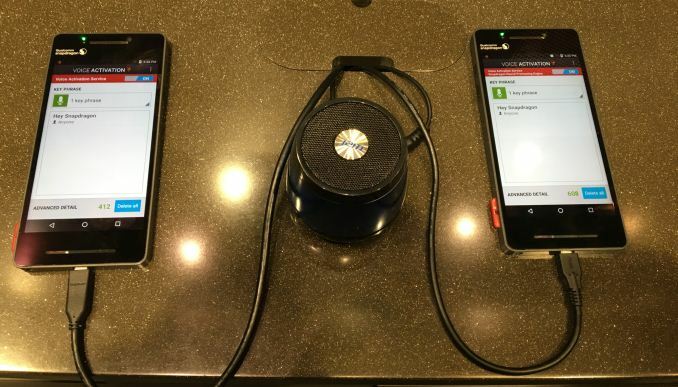 Meanwhile for testing the EIS capabilities of their ISP, Qualcomm has a specialized rig just for shaking phones. The particular ability that makes this rig noteworthy is that it can shake a phone using a pre-determined, tightly timed sequence, so that engineers can go back and see how well their EIS system handled specific motions. The ultimate goal here is to tweak their algorithms to produce good EIS results across a variety of scenarios, so that in average use cases the phone isn’t struggling to stabilize video. 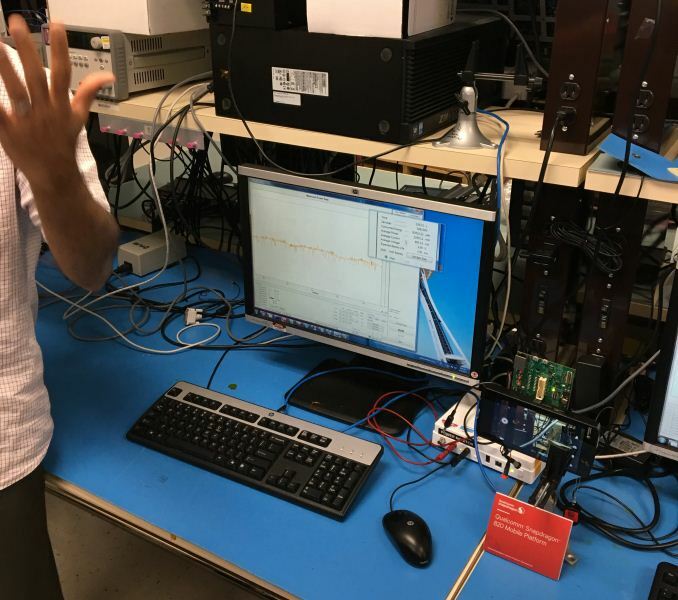 The final stop on Qualcomm’s lab tour was what the company refers to as the Snapdragon Demo Room – which is to say that the company had rolled out a number of experience-based demos to show off various non-benchmark related aspects of their SoCs. This included audio, computer vision, and of course, LTE. In recent months Qualcomm has been pushing the advantages of higher performance LTE modes, which in turn are the basis of what Qualcomm is branding as Gigabit LTE. The most recent LTE categories are leveraging both carrier aggregation and higher-order QAM modes, namely, 256-QAM. These higher-order modes require greater signal-to-noise ratios to be properly received, but in return allow a signal to carry more data, improving the total throughput of the network. 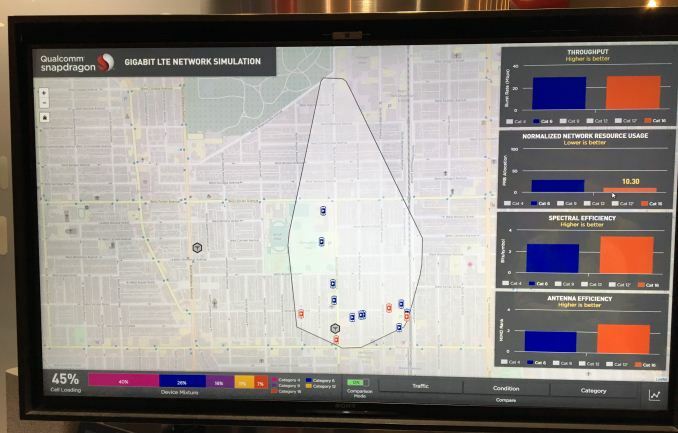 The key point of Qualcomm’s simulations being that even with the tighter requirements of Category 16, it’s useful enough of the time to have a meaningful impact on improving spectral efficiency/reducing network (airtime) loads. Though, as I’m sure Qualcomm is painfully aware, putting theory into practice means getting carriers to upgrade their networks to support higher LTE categories. One particularly interesting demo, even if things didn’t actually go quite according to plan, was iris scanning/recognition on a SD835 reference phone. 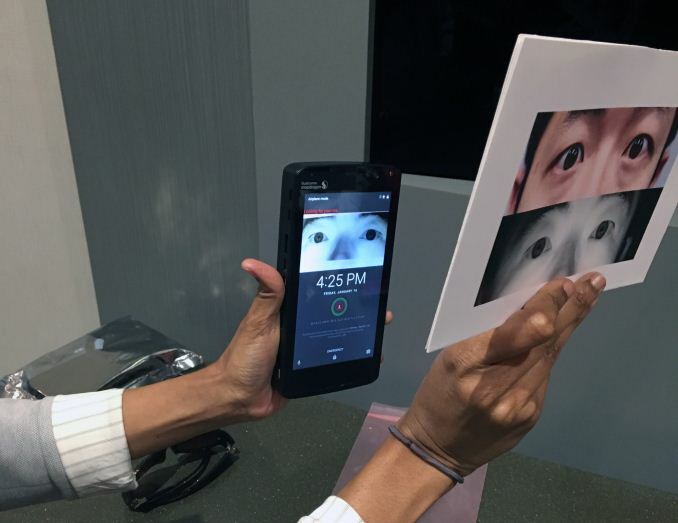 Manufacturers have been toying with iris scanning as an alternative for fingerprint unlocking for a bit now, both as a means to remove the relatively large fingerprint sensor from their bezels and to offer a means for unlocking a phone that doesn’t require one’s hands. With the latest rendition of the technology, Qualcomm was eager to show off the improvements in the technology, as well as reiterate its security. The result was something of a wash; the demo worked very well with the product manager, but the phone couldn’t see/recognize my irises consistently enough to unlock the phone (ed: or perhaps Ryan is just soulless). Which this being a prototype, problems are not unexpected, but it’s a reminder that the tech hasn’t had the same number of development cycles as more proven fingerprint scanning technology. On the flip side of the coin, how well the phone can see the rest of the world is also a subject of interest to Qualcomm. 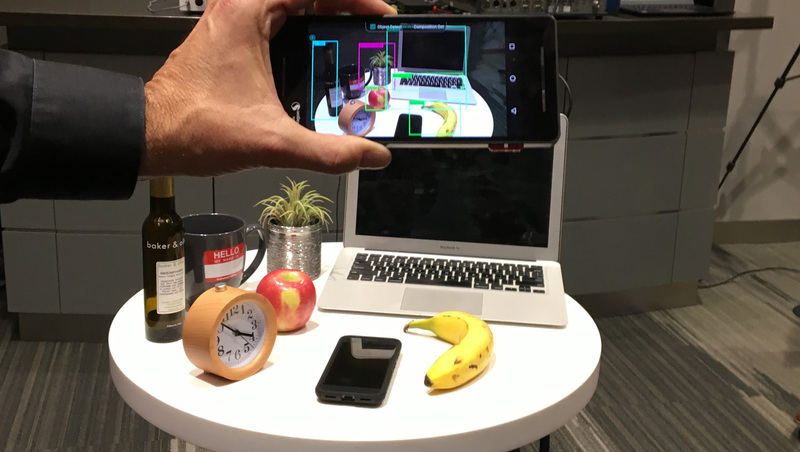 Computer vision/object detection demos aren’t new, but like other players in the industry, Qualcomm is lining up behind the recent advances in machine learning. By being able to efficiently executer (infer) highly trained neural networks, they hope to be able to do things faster and other new things entirely than what traditional computer vision has been capable of doing. Finally, the company was also showing off their audio efforts, both on the playback and recording sides. On the former, they had an A/B setup between a phone and a dedicated receiver to show off the audio quality of the Snapdragon’s audio codecs and DAC, reiterating that at this point a properly designed phone should be able to keep up with dedicated audio gear for non-audiophiles, even with CD (or better) audio quality. Meanwhile on the audio input side, the company was showing off their improved voice activation capabilities for Snapdragon 835. While speed was hit & miss – both the SD835 and SD820 phones often responded in around the same time – over the day the company had recorded the newer phone as more frequently recognizing the activation phrase than the older phone. Overall, while Qualcomm can’t easily quantify most of these experiences, it’s exactly these kinds of experiences that the company is wanting to bring to the forefront of the public’s mind, in order to show how Snapdragon is a platform, and to differentiate it from other SoCs. Just how much success they will have at this remains to be seen, but in the long run how successful they are here stands to have a significant impact in how the company’s chip-design arm presents itself to the world at large, and how it advertises its wares.